The winter and spring weather in Sweden has been very odd, with the weather changing from cold to warm from one day to another. This year we had minus degrees and snow during Easter in late April. With the adaptive systems we have installed we have still been able to keep a steady indoor temperature inside the apartments. With traditional systems it would have either been too cold or too warm. We have also received good results from the smart street lighting and the combined renewable energy production, control and storage system. All these solutions are examples of adaptive control in cities. In this blog I will write some more about these and the other adaptive control systems we are now implementing. What is happening in Valla Torg, Årsta and the Slakthus area buildings? The smart solutions for low energy districts will be rolled out in the building zones in Valla Torg, Årsta and the Slakthus areas (see map here). For an overview of the measures being implemented, click here. In Valla Torg the refurbishment of the first multi-storey building (7G) is going forward and many of the smart energy saving solutions are already implemented. All installations will be finalised in the summer and tested in August. The tenants start moving back into their apartments in September. When the next heating season starts, we can begin evaluating exactly how much energy we can save in these buildings. 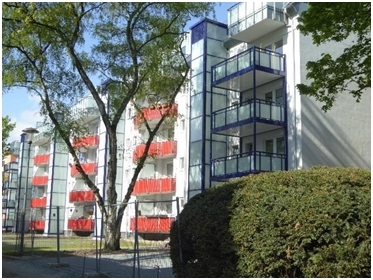 In this building the tenants have the possibility to use the Active House application from Fortum to control the temperature and lighting in the apartment. They can also use the home/away button, which means that when they leave the apartment to go to work or on holiday, they can cut unnecessary electricity and lower the temperature a few degrees in the apartment. With a mobile application they can push the home button, which will adjust heating and electricity back to normal before they arrive home. In the private condominiums Brf Årstakrönet the adaptive control system by Veolia has been in operation for more than a year and has resulted in substantial energy savings as well as more stable temperatures in the apartments over the year. The energy hub that consists of photovoltaics, a current equalizer and battery storage has been in use for half a year. The system provides a higher output of solar electricity and a better interface between the production and use of locally produced electricity. 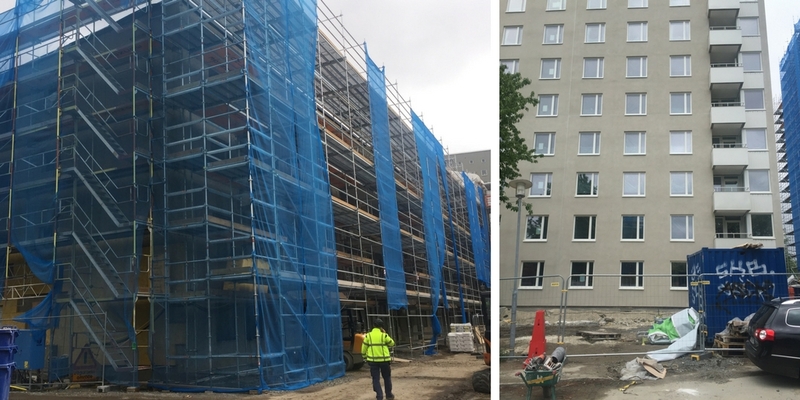 In Slakthusarea the refurbishment of building 8 is well on its way and will be finalised in autumn 2017 by the Fastighetskontoret (Real estate administration office). The selection for a substitute building in Slakthusarea is done and is only waiting for an official approval from the Commission. Work on the substitute building can begin in summer 2017 and all energy saving solutions are to be implemented during this year. The smart LED-street lights (solution 5) have now been in operation for a year. There are three different methods used to adjust the street lights to use less energy while still providing the same sense of security for pedestrians and bicyclists. The first method is applied to street lights on a walking/bicycling path. When there is no movement the lights reduce to 40% capacity. When a person approaches, the lights ramp up to full power and when the person has passed they dim down again. The second method is that each individual luminaire keeps track of when it is turned on and off and uses those times to calculate a middle point. From that middle point, the brightness is lowered to 66% for a duration of 6 hours, or until it is turned off. In the third method, all luminaires are connected to a Central Management System where a dimming schedule runs. In the dimming schedule, lighting levels are set according to sunset/sunrise and specific times during the night. The lighting is turned on at sunset to 100%, at 10 PM it is dimmed to 67%, at 1 AM it is dimmed to 50%, at 5 AM it dims up to 67% again, at 6 AM 100% and is turned off again at sunrise. In Stockholm the smart connected city will use the extensive fibre network provided and administered by Stokab, a company owned by Stockholm City Council (more information) Several Internet of Things applications and solutions can be built on top of the fibre network. The implementation of sensors in the Slakthusarea has faced data protection issues which needed to be examined very carefully. Even if both solutions have previously been used at small scales in other cities, they have never been combined. The combination of sensors measuring the pedestrian, bicycle and vehicle traffic in the area will provide very accurate information about the movement of people. A communication plan must also be produced to communicate to citizens that sensors are collecting data from passing vehicles and mobile phones to be able to provide better traffic flow in the areas, especially during events. The implementation of sensors will be done during August so that the communication plan can be finalised before implementation. IBM, who is responsible for the open consolidated big data platform (solution 8), will analyse data to show how people move around in the Slakthusarea. This starts as soon as the sensors can provide data. The project team, platform for data management, analysis tools and method are all in place. Fortum’s open district heating (solution 6) system has been recovering heat from a Supermarket in Farsta, some 5km south of the Slakthus area. 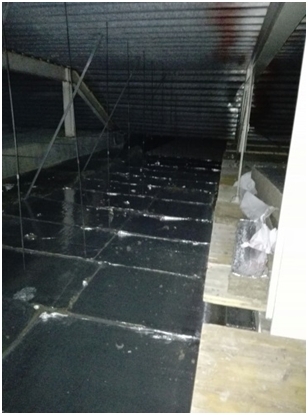 The installations in the data centre will be done in June and as soon as the heating season starts again, the waste heat can be used to heat buildings. The waste handling system provided by Envac will be completed by the end of June. The underground parts of the smart waste handling system (solution 7) are in place (see image below). The terminal and inlets are now being installed. The Building logistics centre (solution 2) implemented by Carrier, will start handling more materials in autumn. Carrier has together with Skanska agreed which material streams can be best handled by the logistics centre, and these materials will be handled by the centre when the next phase of the refurbishment begins later in the autumn. The implementation of delivery boxes (solution 9) by Carrier is being done alongside refurbishments of buildings in Valla Torg. When the tenants move back into their apartments starting in September, they can order packages and other deliveries straight to their homes instead of retrieving them from the nearest service point. The delivery from the service point to the building is done by cargo bikes. Insero is together with NOAE (Network of Automotive Excellence) and Global car OEM, implementing an information system for drivers (solution 10). In Stockholm, ten traffic lights are equipped with software that can communicate and provide information about the status of the light and when it is about to switch to another colour. This is achieved through a data connection between the traffic light, the cars’ on board software and GPS, and a central computer handling the calculations. Through a special device in the car, the driver can receive information on what speed to adopt in order to reach a green light at the next intersection. This information tool will be tested in two cars starting in May/June 2017. Effects on travel time and the drivers’ experiences will be evaluated. KTH has developed a smart phone application (solution 10) to follow up changes in travel behaviour in a way that is more effective and has a greater response rate than traditional travel surveys. This will improve travel demand management measures. In the same application, information about renewable fuels in Stockholm will be shown. This information includes updated information on where each alternative fuel can be tanked, together with the most recent prices. 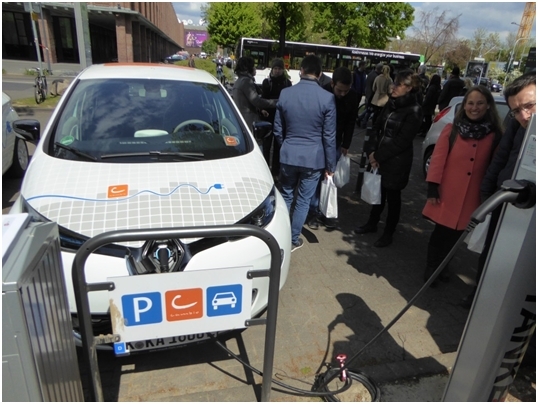 As part of the GrowSmarter project, Fortum has planned to install up to 10 charging stations and one fast charger (solution 11). The fast charger is installed in Årsta. The normal chargers will be installed in Valla Torg, Slakthus area and Årsta by the end of 2017. The first refuelling station (solution 11) for renewable fuels is up and running. The filling station in Årsta is expected to be built in the beginning of 2018. 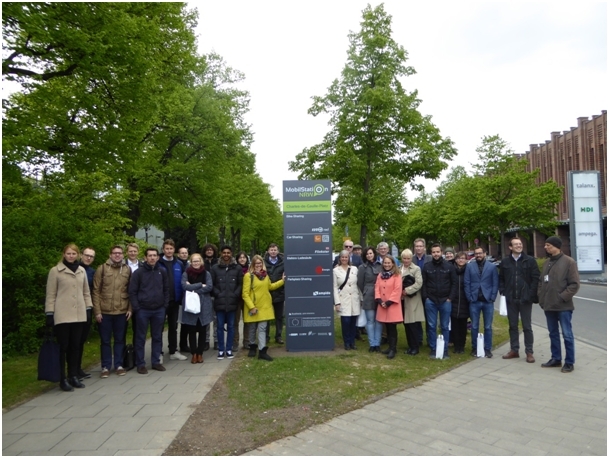 In Stockholm several study visits have been arranged and there is high interest in the GrowSmarter solutions. As more and more smart solutions are implemented, the study visits will become more frequent. In August 2017 there is a plan to have an event demonstrating the smart solutions in Valla Torg. Here the focus is on city representatives. In November/December 2017 a similar event will be arranged in Slakthusarea. In spring 2018 an event is planned for tenants in Valla Torg. A video has been produced showcasing the smart solutions implemented in Stockholm. The video will soon be available at the GrowSmarter website. To see all the measures to be implemented, click here. The CeBIT - Global Event for Digital Business - is the largest trade fair in Europe. From 20 – 24 March 2017 GrowSmarter partners from Cologne present the project at a joint stand together with Lighthouse City projects from Munich and Hamburg (Smarter Together and mySMARTLife). For the fair, the three cities prepared a joint appearance. Click here for more information about the presentation. 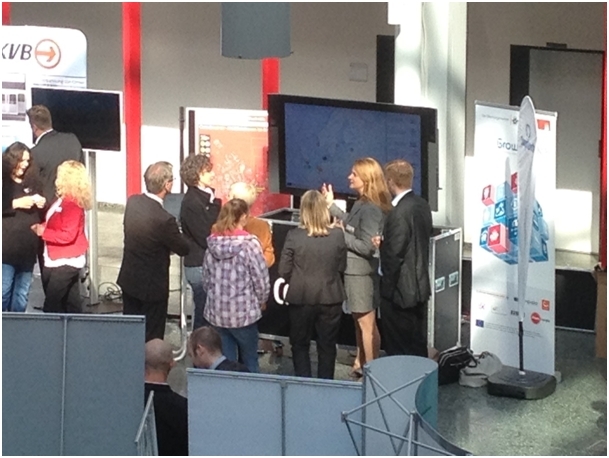 The overview of projects, focuses and targets presented at the event was very well received by visitors. A presentation of the GrowSmarter ran in a loop at the stand. The booth was always surrounded by interested visitors, especially by industry and cities representatives. Many companies see that the approaches developed in the project can generate promising business models. Inquiries also came from representatives from other cities who want to shape sustainable urban development based on the experience of the projects presented. After CeBIT, 12 companies and 3 cities agreed on meeting dates for further exchange of experience. The successful joint appearance of Cologne, Munich and Hamburg will mean that the three cities will again be exhibited together at trade fairs in the future. 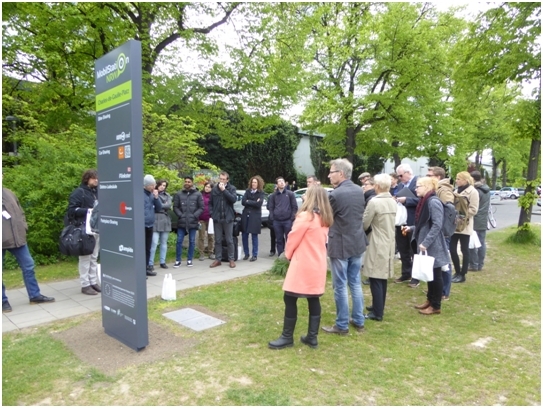 The GrowSmarter Study Visit was a two-day event, including the SmartCity Cologne Conference on 26 April and the on-site visit at the Stegerwaldsiedlung on 27 April. 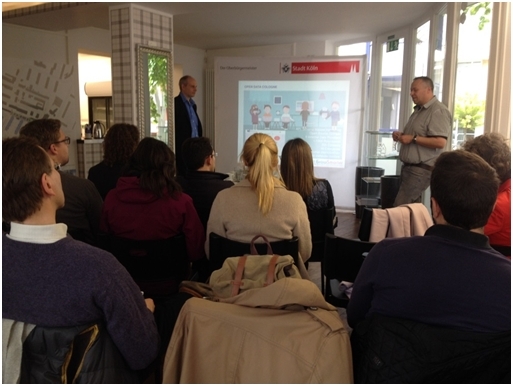 Dr. Rau (Deputy Major for Social Affairs, Integration and Environmental Affairs) welcomed the Study Visit participants in Cologne on 26th April. He gave a short introduction and overview of Cologne’s current situation in areas such as environment, demography, economy and mobility. Cologne is an important economic and cultural center in Germany, which is currently facing a dynamic growth period: its economy is thriving and its population has just surpassed one million. Therefore, Cologne faces large challenges in terms of growing mobility problems, lack of qualified workforce and increasing energy use, to name a few. Dr. Rau pointed out that extremely high traffic loads (Cologne is the city with the most traffic jams in Germany) have brought about a strategy of change in the direction of more sustainable urban development. The GrowSmarter project and the solutions found therein are testing grounds that could lead to implementation across Cologne. Following Dr. Rau’s introduction, Dr. Barbara Möhlendick gave an overview of the Smart City Cologne initiative and projects as well as how the GrowSmarter project came to be in Cologne. Julia Egenolf presented the planned measures in GrowSmarter and the current state of their implementation. 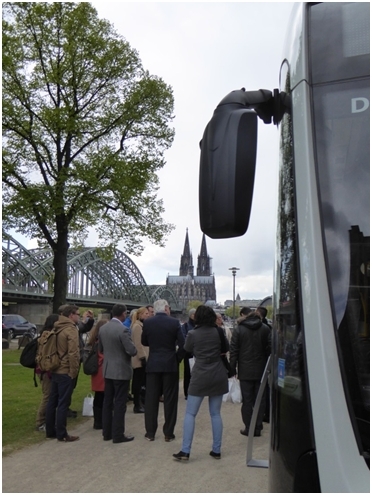 The subsequent SmartCity conference: Köln - mobil 2025+ introduced a variety of alternative mobility concepts. Sven Plöger (German TV weatherman and keynote speaker) delivered a fascinating speech about the mechanisms and consequences of climate change related to global and local events, including the City of Cologne. The reduction of CO2 is of utmost importance and the contributions from the Cologne SmartCity projects’ energy-saving solutions, such as the GrowSmarter project, are of immense important. Start-up entrepreneurs were also at the conference, showing how successful business models have emerged from alternative transport concepts. 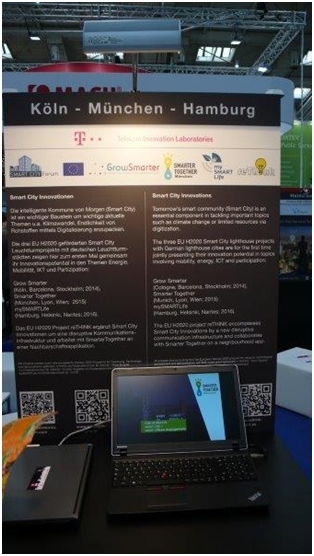 At the GrowSmarter booth, Cologne showed the GrowSmarter mobility measures on a touch screen as well as an overview of all Horizon 2020 SmartCity projects since 2015. 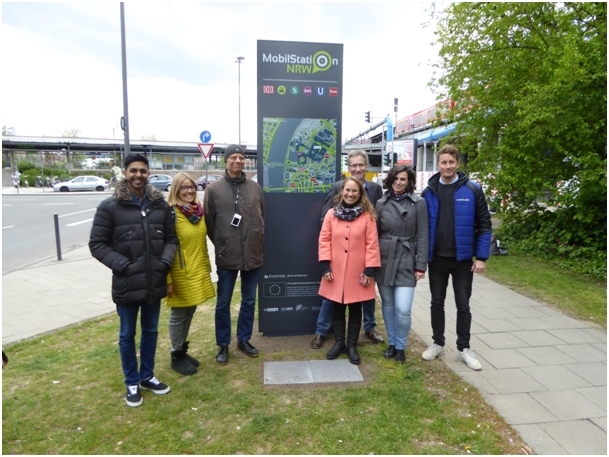 Visitors were invited to use the interactive touchscreen to learn about the individual measures in Cologne, Stockholm and Barcelona as well as the other projects, such as Triangulum, Remourban, etc. 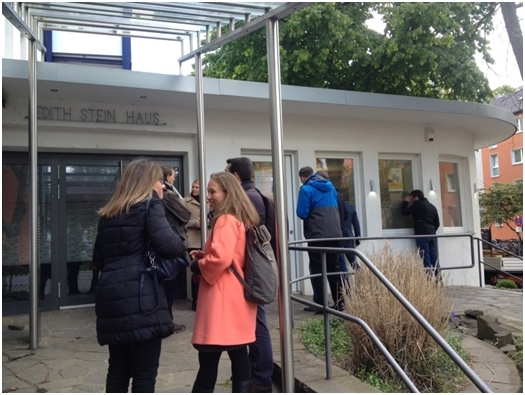 On 27 April, participants toured the Stegerwaldsiedlung, where they could see energy refurbishment and alternative mobility measures implemented through GrowSmarter. An important outcome of the discussion with the GrowSmarter partners was the fact that solutions can only be implemented if city and industry partners cooperate closely and strive for a win-win situation. It was also clear that the success of the measures depended greatly upon clear compliance with legal frameworks. The concept of the mobility stations – multi-modal transport hubs – was well received by participants, and several cities were interested in implementing similar stations. The intensive exchange on the data platform led to planning of further discussions and meetings. The acquisition of data and the goal of providing as much data as possible to the citizens openly and free of charge were seen as a major challenge. 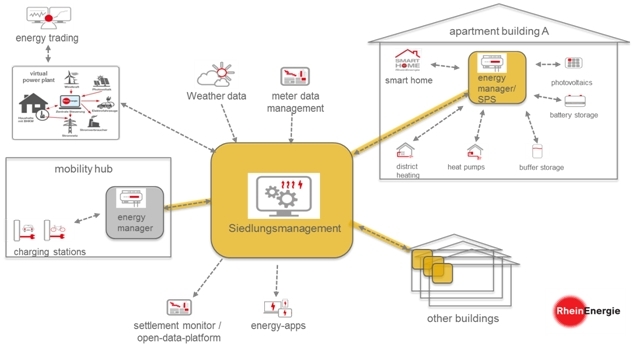 The visits to the Stegerwaldsiedlung as well as the computer centre successfully showed that complex energy-efficient solutions can be implemented within existing buildings in smart ways. Participants positively evaluated the usefulness of the Study Visit, answering either “good” or “excellent”. 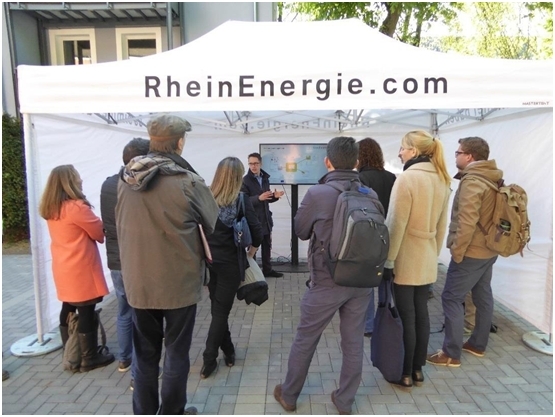 On 27 April 2017, RheinEnergie presented the current state of implementation of the measures in WP2 (Low Energy Districts) and set up a pavilion in front of the first completed buildings. 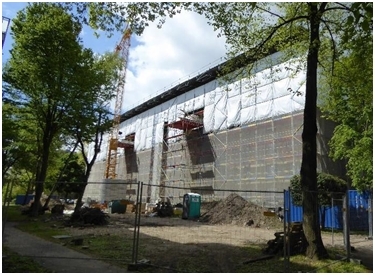 The refurbishment of the first construction phase was completed by DEWOG. The second construction phase is in progress. 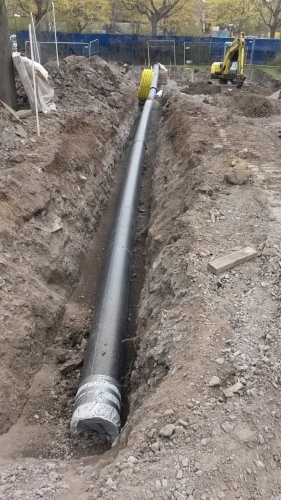 The settlement was connected to the district heating grid and the buildings from the first construction phase have been using district heating since December 2016. The installation of heat pumps and battery storage for the first construction phase will start in May 2017. During a tour around the settlement and in the basement, we presented the current state of the project and share our experiences gained from implementing the solutions. 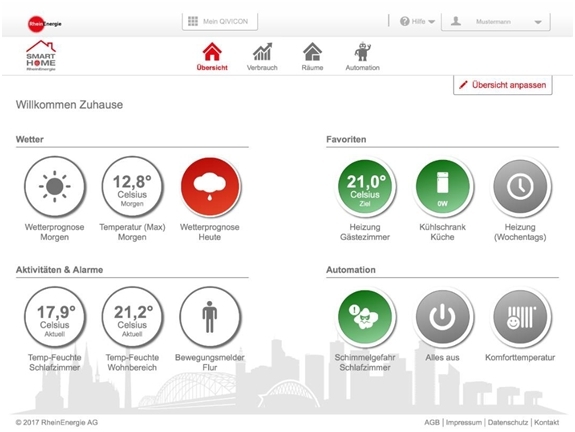 Furthermore, the energy management software, the “Siedlungsmanagement”, was explained in detail, including the forecasting and optimisation modules. The software is still in development, as not all of the devices that it will manage have been installed or connected yet. The system will learn from past events and self-regulate to optimise energy flow. 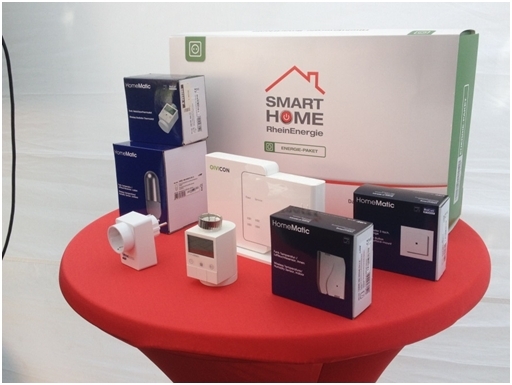 At the End of the presentation, the Smart Home System from RheinEnergie was presented along with a demonstration. The evening Hackathon event on 27 April demonstrated the building and use of cost-effective environmental sensors. As all cities admitted having issues producing good-quality environmental data at acceptable costs, this was an especially relevant topic. The more citizens that use environmental sensors, the more they can help improve the city's measures for reducing air pollution. It Cologne’s Smart City Solutions were very interesting for many other cities, who have now started developing own concepts for similar solutions, such as Nürnberg or Porto. The study visit was a good opportunity to share knowledge, findings and experiences and to get closer in touch with each other in order to transfer knowledge and results. For example, Cologne and [ui!] now have a better understanding of what the follower city Porto needs and what results might be easily transferable from Cologne to Porto. 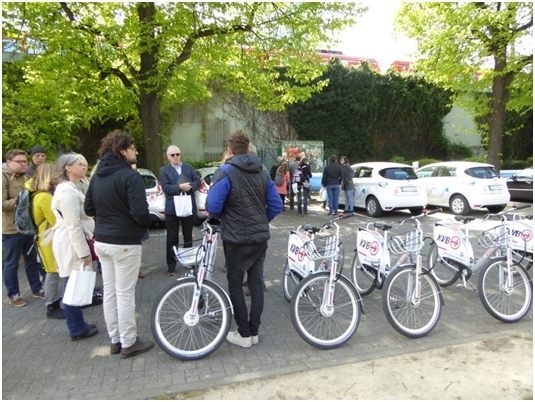 On 27 April 2017, participants visited the mobility station “Charles-de-Gaulle Platz near the Deutz Train Station, a multi-modal transport hub that brings together various modes of public and private transport. 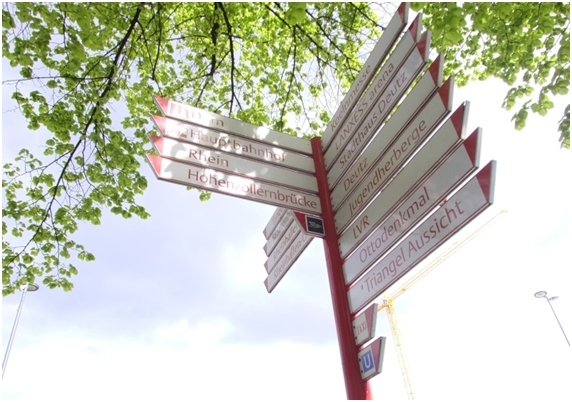 Together with the state of North Rhine-Westphalia (NRW), the city of Cologne has designed signage to identify the mobility station and the transport options available there. It’s also planned to install a mobility station sign inside the train station, which is currently under negotiation with Deutsche Bahn AG. The station for (e-) bike sharing is expected to be built in the fourth quarter of 2017. The intended location is between the ampido station and the public charging points. Until now, KVB-AG has already been operating a conventional bicycle rental system. KVB-Bike started in May 2015 as a free float system. Today there are nearly 1,500 bikes in circulation across an area of 84 km2. It is integrated in the public transport systemof Cologne and the surrounding area. But what does “integrated” really mean? Regular public transportation customers receive annual passes as an e-Ticket on a smartcard and soon on a smartphone too. Over 600,000 people are now e-Ticket holders. With that e-Ticket, customers get access to public transportation, KVB-Bike and probably in autumn to CambioCarsharing. This means that with one e-Ticket, they receive access to many different vehicles. In the case of KVB-Bike, customers can register for the service directly at the bike by holding their e-Ticket on a card-reader attached to the bike. After providing a mobile phone number and accepting the terms and conditions, a 6-digit PIN is sent via SMS and the bike lock opens automatically. Once successfully registered, customers are able to rent a bike via eTicket + PIN, phone number + PIN, or a smartphone app. A KVB e-bike is still in the development phase, with a prototype to become available in 2017. The first e-bus project started in 2014. KVB AG ordered eight articulated, full-electric buses. Because of the high additional costs compared to a diesel bus, KVB needed financial assistance. The total contribution for the project was € 1.92 million. There are two interfaces for charging the vehicles. The first one is the pantograph; it is placed on the roof of the vehicle and is used for fast charging with 240 kW at both end points of the bus route. The second charging interface is designed for slow charging at the depot via cable and CCS connectors with 50 kW charging power. We needed to make some adjustments at the workshop for the electric buses. For example we needed a frame for working on the roofs of the buses, insulated tools, personal protective equipment, and an overhead crane. The company Cambio is currently operating a car sharing scheme on Charles de Gaulle square with a total of 5 parking spaces. The charging infrastructure allows Cambio to operate a total of three electric vehicles and two conventional vehicles at this location. Cambio explained the registration process for car sharing during the study visit. It was particularly interesting for the participants to learn how quickly one can use vehicles after registration. Tanya Bullmann gave a brief overview of the future planned online validation possibilities via camera, followed by a demonstration of how easily and comfortably the vehicles can be booked and borrowed. Participants were particularly curious about the networking possibilities with other forms of mobility. Cambio explained the concept of the mobile ticket planned together with KVB for 2017. This idea was received very positively by the participants. Following the presentation of the electric vehicles, RheinEnergie presented the corresponding charging technology for the e-vehicles. 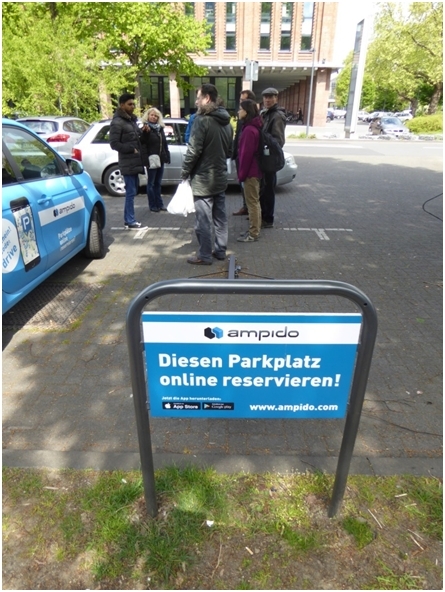 Ampido currently operates its online parking management system all across town at many privately owned parking spaces. For the duration of the GrowSmarter project, the state of North Rhine-Westphalia allowed ampido to introduce its system at three mobility station locations on public land, so far with a total of five parking spaces. In their presentation, ampido noted that the pilot project reduces CO2, reduces time spent searching for parking spaces, and can even lower parking prices. By using the parking app, we can get rid of parking ticket machines and achieve faster cost coverage, leading to reduced parking prices. 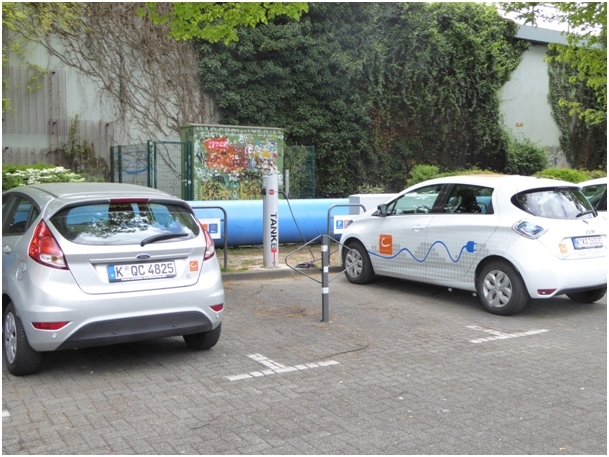 The e-charging stations from RheinEnergie are a practical addition: customers can reserve not only a parking space but also a charging location. With this combination, CO2 savings are improved further. Two public charging columns provide charging interfaces for a total of four electric vehicles. Non-electric vehicles are forbidden from using these parking spaces. 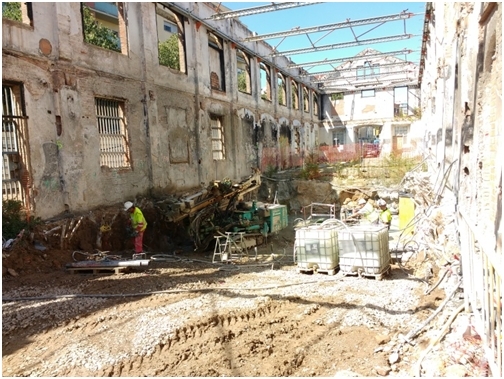 The refurbishment work in the future office building Ca l’Alier is ongoing. The building, owned by a Public-Private Partnership between the Municipality of Barcelona and Cisco, is composed of three units built in 1877 with a total surface of 2,400 m2. It has been out of use for a very long period, and thus suffered from degradation of the building facilities. 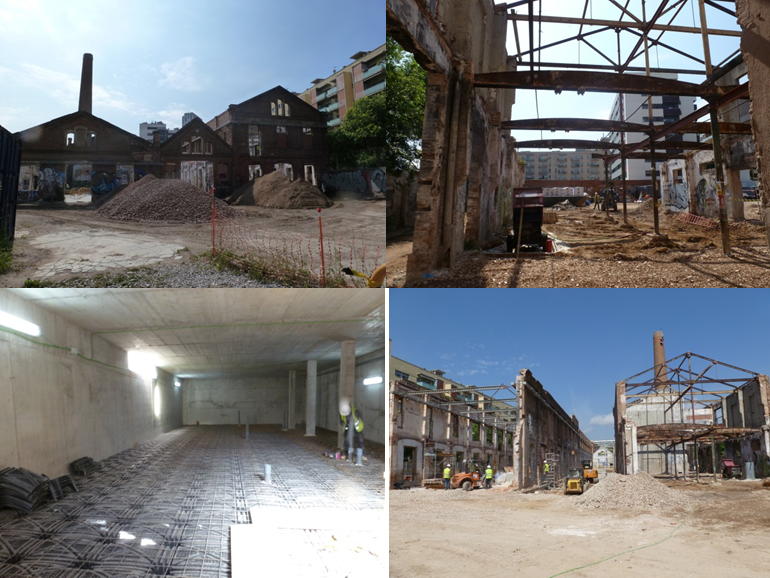 The old textile factory will be rebuilt into a nearly Zero Energy Building (nZEB) including a range of passive and active measures. nZEB describes buildings with energy use near to 0 in a “typical year”, meaning that much of the energy consumed comes from the building itself by means of renewable sources. The renovations will be carried out in order to turn the building into a "prototype of a self-sufficient habitat" that produces enough energy resources to meet its own demand. The project aims to achieve a Platinum LEED (Leadership in Energy & Environmental Design) certificate awarded by the US Green Building Council. Work on the foundation started in June 2016 and finished in April 2017, which is now followed by refurbishments to the basement, paving and underground sewage networks that started in April 2017 and will continue out through 2017. Ca l’Alier will demonstrate the feasibility of an nZEB site through active technologies, such as LEDs and occupancy sensors for lighting, variable speed fans and free-cooling for HVAC (Heating, Ventilation and Air Conditioning), photovoltaic panels, connection to the local DHC network that uses waste heat from Municipal Solid Waste incineration, and a Smart Energy Management System. 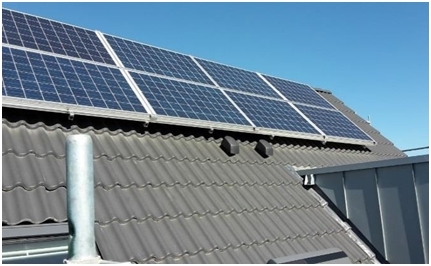 Passive measures include exploitation of natural lighting, wall and roof insulation to lower heating and cooling demands, and rainwater collection to lower water consumption, among others. In order to meet the technical specifications for nZEB, coverage of 70% or more of the consumption of primary energy will be from renewable resources while a special effort in the design has been put on lowering the building energy demand. Also, the energy management system will be capable of optimising current consumption and forecasting the future building energy consumption. Finally, Ca l’Alier will demonstrate the compatibility of open communication protocols with HVAC equipment. With advanced ICT infrastructure, advanced control of facilities and connection to district energy networks, Ca l’Alier integrates the features of a low energy district and will be an excellent demonstration of smart city solutions in the city of Barcelona. Following the audit, engineering, proposal and negotiation phases, a participation agreement was reached within GNF and Fundació Claror. The sports centre up for refurbishment within GrowSmarter is the Cartagena Sports Centre, located in the Sagrada Familia neighbourhood in Barcelona. The refurbishment is taking place under an Energy Services contract, through which the Energy Services Company (ESCo) provides a turnkey solution and provides the initial investment, while the customer pays an annual fee. Fundació Claror is a non-profit organisation that manages publicly owned sports centres. The organisation is interested in carrying out energy refurbishments in the facilities they operate to improve sustainability, energy and economic efficiency, and increase comfort. This and several other sports centres in the city are publicly owned, and exploitation is awarded to private companies by the Barcelona Sports Institute (IBE, in Catalan). This organisation has also participated in negotiations and supported the project. The Cartagena Sports Centre is an urban sports centre with a large swimming pool area (over 600 m2), a spa area, an indoor sports pitch and a fitness area. Other facilities include group activity rooms and spaces dedicated to physical therapy. The total surface area is close to 3,000 m2. Current equipment mainly consists of natural gas-fired boilers that satisfy most of the heating demand and DHW needs, electric heaters that serve the spa pool, an electric chiller that serves air handling units (AHUs) in the fitness area and other spaces, and dehumidifiers for the pool and spa areas. In the framework of GrowSmarter, an integrated refurbishment of the Centre’s facilities will be carried out, ranging from passive measures that aim to reduce thermal demand to installation of new equipment to increase energy efficiency in the production of thermal energy. The measures selected are intended to complement each other and achieve a technically and economically optimised level of investment and savings. Work in the sports centre began in April 2017. 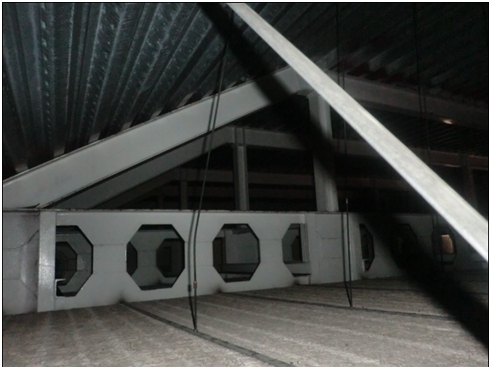 As passive measure, the roof over the main pool hall has been refurbished by adding a layer of insulation within the dropped roof to reduce losses through this surface. The heating demand of the pool hall will be further reduced by replacing the current dehumidifier with a new machine that consumes less electricity and includes a thermal recovery module. 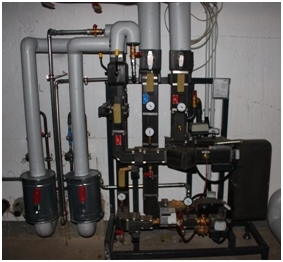 The bottom line is a reduction of the electricity consumption and heating needs of the pool space, ultimately reducing the amount of heat required from gas-fired boilers. The current chiller will be replaced with a new electric heat pump that produces heating and cooling at a high efficiency. 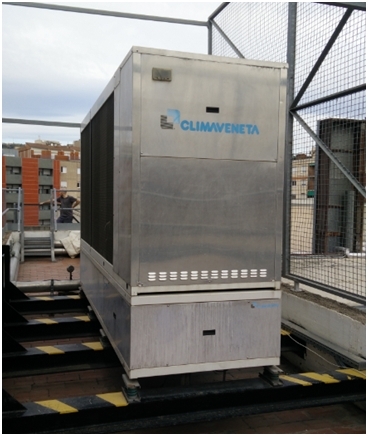 In order to integrate this heat which is available at 40-50ºC, it is necessary to separate existing thermal demands in low temperature and high temperatures through modifications in the distribution system. This solution is especially interesting in buildings with simultaneous heating and cooling needs such as sports centres (pool spaces are often heated while other areas are cooled). 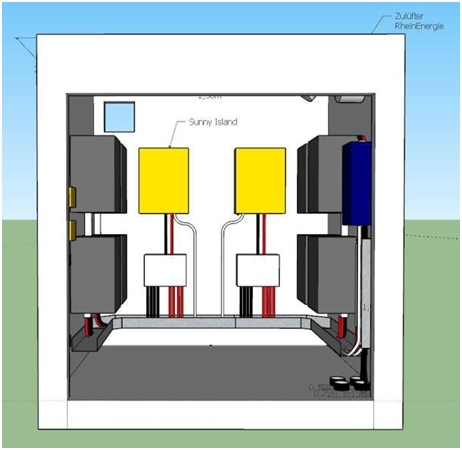 To further capitalise on high-efficiency heat from the heat pump, the spa basin will be connected to the new heating ring. This will yield important electricity savings, as it is currently being heated using electric resistance heaters, which are very inefficient. Heating needs not covered by the EHP (e.g. 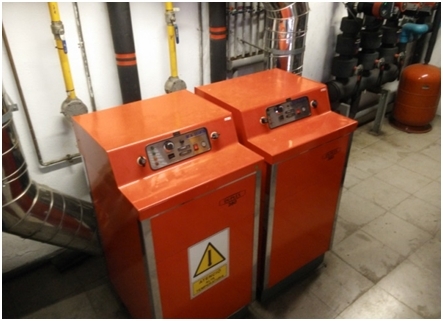 DHW heated up to 70-80ºC for sanitary reasons) will be covered using a new set of high-efficiency boilers replacing the existing ones. Important electricity savings will come from replacing existing lighting equipment with equivalent LED lamps. New equipment and other key systems will be monitored with a new Building Energy Management System (BEMS), which will provide relevant information for more efficient energy management and allow remote monitoring of main energy indicators via web access. Altogether, total energy consumption is expected to be reduced by more than 40%. Gas Natural Fenosa has been offering Energy Services contracts to commercial and industrial customers for several years, including several sports centres in Barcelona, making this project highly replicable in further clients. Through this contract, Gas Natural Fenosa guarantees energy savings for the sports centre, providing an increased value to the solution from the client’s point of view. Data gathered by the BEMS will be fundamental to assess these energy savings. Furthermore, the company guarantees the correct running of the refurbished systems for the duration of the contract. This project has received funding from the European Union's Horizon 2020 research and innovation programme under grant agreement no 646456. The sole responsibility for the content of this website lies with the GrowSmarter project and in no way reflects the views of the European Union.